Cleveland Indians' scouting report on prospect Kyle Washington: "He's worn the smaller version of our racist logo so well he's earned a chance to wear the big racist one. ... Good at chopping wood; haven't seen him swing a bat. ... May not know how to hit against live pitching, but he sure looks determined when he's posing for baseball cards. ... We have an opening for a guy with a 14-year-old's mustache. ... Swings with his chin tucked between his shoulder and chest, which is dumb but pretty funny to watch. ... This kid has proved he's a heckofa tucker despite working with a worn-out belt and a minor-league jersey. ... 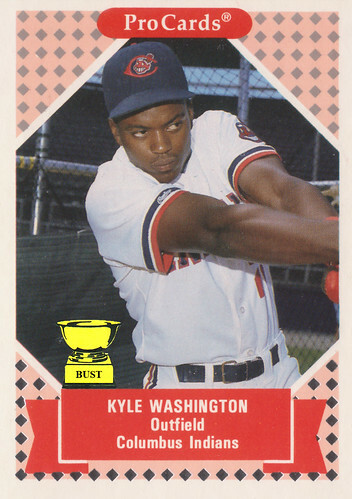 Easily the second-, make that third-best baseball player named Kyle Washington in Columbus, Ohio. Make that fourth-best."